It's during the evening hours—especially during the warmer months of the year—when you can really enjoy your patio, deck, and yard. Work is done for the day, you may have grilled outside, and it's time to kick back and savor the company of family and friends. But what about the extras, those little things that might coax you to stay outside and drink in the starry sky? A glass of wine or cocktail might help you unwind, and a fire pit is nice to gather around for conversation. 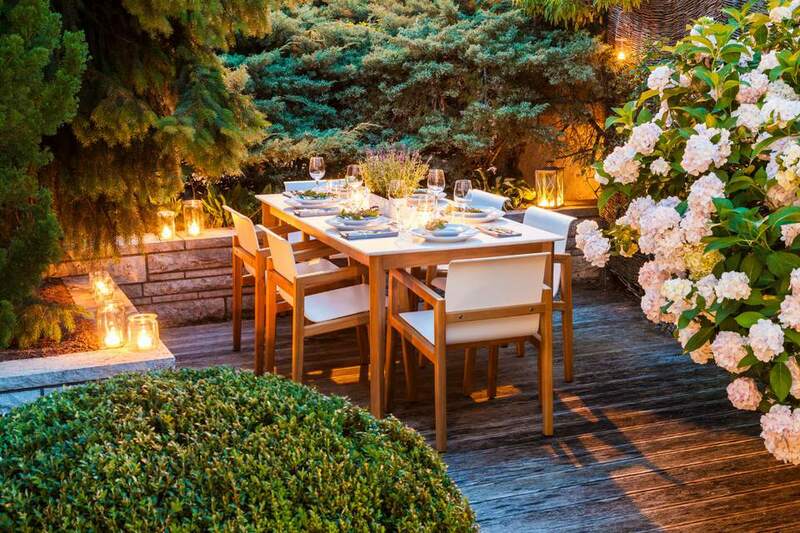 Candles, lanterns, or soft lighting can create a relaxing atmosphere and allow guests to stay outdoors longer but if you really want to tap into the senses, consider introducing wonderful, heavenly scents into your outdoor space. And not just with candles or incense—you'll want to go for the real thing. Some plants, especially those that produce flowers, smell stronger and sweeter at night. Planting fragrant bloomers in beds and containers on patios, porches, and near outdoor spaces puts them up close and personal with you and your guests where you can inhale intoxicating aromas that can't be duplicated. Why Do Some Plants Smell Stronger at Night? Flowering plants depend on birds, insects, or the wind to move pollen from one flower to another. While some flowering plants lure pollinators with their colors, others attract them with their scents. Plants that need to be pollinated by night-flying insects and bats smell stronger in the evening, when they are ready for pollination and when their pollinators are most active. Place near a porch, patio, near outdoor seating, or along a path. Stay away from combining scents that might compete or become overpowering if concentrated in a small area. Plant according to light, water, and soil needs. With research and planning, you can have a sweet-smelling garden or patio all year round by knowing what blooms when and staggering accordingly. Plants that are especially fragrant will do well in areas that receive lots of traffic, like paths, a patio seating area, or near windows. These South American natives bearing trumpet-shaped flowers in white, pink, or yellow grow well under eaves and against walls. Container-grown plants will be smaller and can be moved indoors if frost is a threat. Its fragrance picks up at night. The only angel's trumpet that is not scented is B. sanguinea, which has an orange-red flower. Botanical Name: Lilium "Casa Blanca"
This Asian lily should be planted in spring or fall and will bloom in August and September. It looks good when planted in groups of three or five identical bulbs and is happy in a container. A large white bloom, Casa Blanca produces a sweet aroma. A native to the western United States, this perennial/biennial attracts night-flying insects which are drawn to the flower's lovely scent. As the name might imply, evening primrose opens quickly at dusk or on overcast days. White to pink blooms are heavy in spring to autumn. Evening Primrose is a drought-tolerant plant that grows in poor soil or rocky areas and likes full sun. Another variation of O. caespitosa, yellow O. biennis attracts moths, hummingbirds, honeybees, and bumblebees, which pollinate the primrose. Easy to grow, it can become tall during its second year, when it flowers, sets seed, and dies. These South American natives are upright growers that can be identified by their large, oval leaves, sticky stems, and foliage. Tubular flowers open after dark and on cloudy days, and are especially fragrant at night. A native to Peru, marvel of Peru seeds were sent to Europe by Spanish explorers in the 1500s. Mounding plants that reach heights of three to four feet, four o'clocks are enjoyed for their variety of colors: yellow, red, pink, white, and variations thereof. Not surprisingly, flower blossoms become more fragrant in the late afternoon (around four pm) until early morning hours. A native to Japan, China, and Taiwan, this plant is noted for its glossy, bright green leaves and single or double white flowers that are strongly scented. To grow, plant them in fast-draining soil with plenty of organic amendments and give them room for their roots to spread. Gardenias perform well in containers, raised beds, as espaliers, and as low privacy or green screens. A native of Peru, this flower is a summer annual that produces blooms in purples, blues, violets, and whites. Most do well in pots and containers and need well-drained soil. Scent is sweet and delicate. Care: Partial or full shade; water varies by species. Bear's-foot hellebore (H. foetidus) bears clusters of flowers that are light green with purplish red edges that become foul smelling (malodorous) if crushed or bruised. This is also known as the stinking hellebore. The species listed above are especially fragrant; some jasmines have little or no fragrance. Most are vining shrubs that grow quickly if given good soil and regular sunlight. Flowers are white, yellow, and pink. J. sambac Arabian jasmine "Grand Duke" produces double flowers that are used for leis in Hawaii and for making perfume. In Asia, this species is used to make jasmine tea. This tropical beauty is native to Asia, India, and the Himalayas. Kahili ginger grows to 8 feet high, which would make a dramatic accent to a garden that borders a patio or deck. Flowers are yellow with red stamens and produce a rich fragrance, especially during late summer evenings. Believe it or not, this ginger is considered a pest on the big island of Hawaii. This Mexican native features clusters of sweet-smelling white flowers that resemble orange blossoms. Flowers open in late winter or early spring and bloom continuously for a few months, then intermittently throughout the summer—attractive to bees and makes a good privacy hedge or screen. Ipomea, or morning glories, are native to tropical and subtropical regions. The genus includes several ornamental vines, including the sweet potato (edible). I alba, or moonflower, is a fast-growing vine that can provide shade for an arbor, patio roof, gazebo, or trellis. With the right growing conditions, it can reach 20 to 30 feet in just one season. Leaves are heart-shaped, and blooms resemble funnels. Flowers are white, appear in the evening, and are visible and extremely fragrant throughout the night. This fast-growing shrub native to the West Indies can grow up to 12 feet tall and wide. Creamy white blossoms appear in summer, producing a powerful fragrance at night—prefers full sun for the most beautiful blooms. Botanical Name: Frangipani, Pua Melia. This native to tropical America is grown as a shrub or small tree in warmer climates. Flowers range from white to yellow to pink and variegated Flowers are sweet-scented and bloom spring through fall. A native to Burma, southern China, and India, this tropical plant gets its name from its waxy leaves and flower clusters. A slow-growing, woody vine, H. carnosa does well in hanging baskets on patios and porches. Flowers are creamy white with a pink center and produce a lovely fragrance that is stronger at night.